We hear it all the time. And we can’t wait to hear it from you. 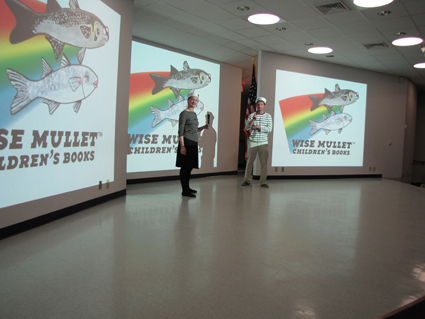 Our Wise Mullet tales take students on a journey of close calls and marvelous surroundings that will nurture a love of reading and writing. Since 2005, we have educated and entertained at over 250 schools and 100,000 students (pre-k to 8th grade) from Florida to Louisiana. Dramatic storytelling, gorgeous illustrations, Character Ed values & the author’s love for the Gulf Coast make these tales perfect for AR celebrations, heritage awareness, Family Reading night, or any other time of the year. Older students will be fascinated by how the author’s digital photos and the illustrator’s paintings are combined with a computer to make our illustrations, which we call “mullet montages.” For the younger students, our interactive presentation (illustrations via powerpoint) will make them active, participating listeners. Presentations, which also show photos of the author growing up fishing on the Gulf Coast, conclude with a cast net demonstration involving a dozen students. We know school budgets are being cut. And teachers are being asked to do more with less. 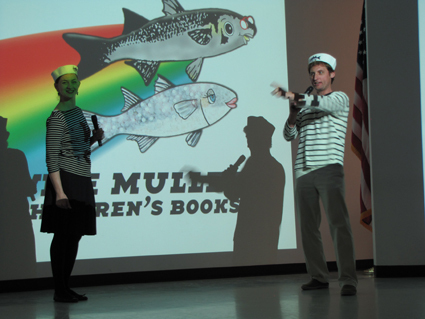 So for the 2011-2012 school year we’ve cut our already-low author visit fees by 30% to 60%. Imagine an author visit under $200! It’s possible, depending on the timing and location. So how about an unforgettable presentation of Goldie’s Search for Silver that will inspire your students to read & achieve? • Sessions last 35-45 minutes. • Half-day visit (regularly $320 – now $160 to $220) includes 2 sessions (such as k-2nd grade & 3rd -5th grade)& book signing + 3 free books. • Full-day visit (regularly $600 – now $250 to $400) includes 4-5 sessions, book signing + 3 free books & parent night (optional). • Free teacher’s kit ($85 value) with full-day visit. Hello again! I talked with my principal and she’s very interested! In fact, she wanted me to see if you could come the week of April 19 (we’re on Spring Break this week), but I see that your calendar is a bit full. Is there any possibility that you could come Monday, May 3 or Thursday, May 6? If not, could you possibly give me two or three dates that are good for you and I could run them by my principal?